We are offer high quality products, look for things you like now! Welcome to Harmony Hammocks, where we know what the ancient Maya knew: hammocks rock. Humans have been resting tired bones in hammocks slung between two trees for over a millennium, and now you can find the hammocks you need, want, crave, and must have right here, all available for fast shipping from our stand of coconut palms to yours. At Harmony Hammocks, we pride ourselves in offering you a wide selection of hammock products to fuel your hammock passion. We love the laidback hammock lifestyle as much as you do, so we're constantly scouring the industry to find the best of the best – bringing these products to you for your utter and sheer relaxation and enjoyment. Need help choosing the right hammock? While we know it's hard to pick just one, here are some of the top-selling hammock types in our store. Brazilian hammocks are a traditional type of hammock that usually features a bold, colorful design with fabrics that are woven by hand using premium cotton. Thick cotton makes these hammocks ideal for use in both warm and cool weather; since the material doesn't breathe as much as other types of cloth and because the weave of these hammocks is super solid, they are just the thing for snuggling up into on a chilly evening while you sip a mug of hot cocoa and watch the leaves turn colors. 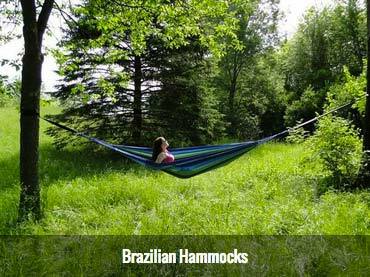 Most Brazilian hammocks lack spreader bars, so you can cocoon yourself inside and hide away from the world, if you so choose. See our inventory. 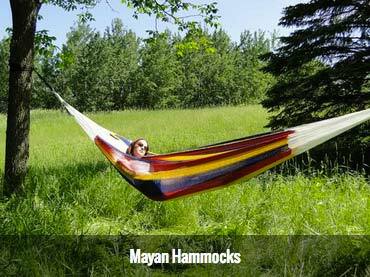 Breathable and airy, Mayan hammocks are ideal for warm weather. They feature cotton or nylon construction in a flexible weave that allows for the circulation of air. As a result, these hammocks tend to be easy to flex, adapting to the size and shape of your body and your movements during use. Because the Mayan hammock is made from natural materials that tend to mildew and mold, we recommend protecting them with a hammock sock. Shop online now. The classic rope hammock is often what people envision when they think of hammocks in general. 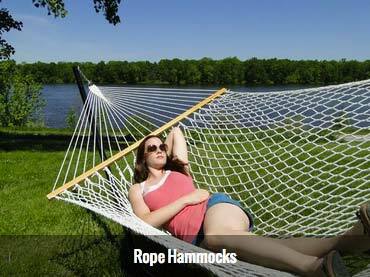 This is the same type of hammock you likely saw Gilligan and the Skipper humorously battle on Gilligan's Island. It's made using a series of woven ropes and stretcher bars that keep the resting surface open for a bed-like feel. 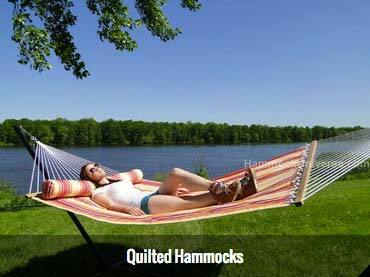 These hammocks tend to be among the airiest and many people tout their comfort as being optimal to other types. In Nicaragua, many people still prefer sleeping in hammocks to sleeping in beds, and you'll totally see why once you bring home a Nicaraguan hammock. These non-spreader-bar hammocks are ideal for sleeping, with their tightly stitched yet breathable design. You often see Nicaraguan hammocks with decorative crocheted fringe for a fun look. We're not sure if it has a purpose, but it's easy on the eyes. See more now. Because the quest for comfort never ends, someone came up with the idea of the quilted hammock, and we say to them "You're a genius!" This is a traditional spreader-bar hammock that's been souped up to include a layer of batting inside two layers of polyester or other material, so when you lie down on it, you feel like you're floating on a cloud. The lack of stitching and rope gaps make quilted hammocks appealing to families with small children. Most are installed on hammock stands. View more. You don't have to live the rockstar lifestyle to lounge by the pool in a hammock. Our pool hammocks are water-resistant, so you can use them in the most splash-prone areas, making them ideal for times when you want to sun your buns within close proximity of the water. View our selection. If you're a true hammockist at heart, then you can't bear to part with your hammock while you go camping or backpacking. For you, we offer camping hammocks. The camping hammock is a type of hammock that offers the full benefits of hammock lounging in a woods-friendly format. It's lightweight, so you can add it to your gear without bogging yourself down, and it folds up compactly, so it stores in your backpack in a minimal amount of space. It is also easy to install, so you can be snoozing away in no time – just find a couple of trees and claim the spot as your own. We also sell a mosquito net camping hammock that provides a layer of defense between you and the winged critters that call the woods home. View the collection now. For the less horizontally inclined, we sell hammock chairs that give you the chillaxing benefits of a hammock in a vertical position. Yes, sitting in a hammock for hours on end catching up on your "me" time is appropriate. These chairs hang from a ceiling beam on the porch or even inside your home, or you can install them from the bough of a tree or from a hammock chair stand. 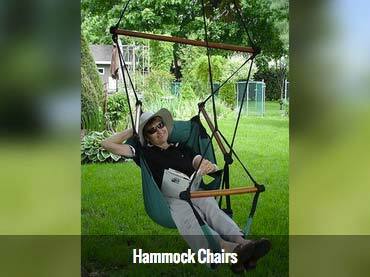 We also sell items to make the hammock chair experience even more pleasant, such as a chair spring for a bouncing effect and a chair swivel that lets you turn your chair around 360 degrees. View more now. Don't limit your hammock installation to simply hanging your hammock between two large oaks in the back yard (although that does sound heavenly, doesn't it?) Check out our hammock stands that let you choose the spot that's most suitable for installing your hammock – whether that's on a porch, balcony, or in the middle of your living room (hey, we won't judge!) We have steel hammock stands, wood hammock stands, and hammock stands that have steel frames covered in resin wicker – so we're sure you'll find just the right option when you shop with us. Top off your hammock purchase with hammock accessories that make hammocking (that's a thing, right?) even more fun and installing your hammock even easier. From chain hanging kits to drink holders to keep your beverage of choice close by, we offer a wide array of must-have products for the true hammock lover. I had to send you a note about my most recent travels. As a precursor, I have to say that when I think of the word hammock it makes me smile. It makes me think of relaxation and vacation. I truly believe it would be near impossible to sit in a hammock and not feel the weight of the world lift off your shoulders. Nothing says peace and tranquility like relaxing in a hammock and the feel of a warm breeze caressing your face after a long day. Whether you are enjoying the shade of a lush palm tree with the heat of the sun on your skin while vacationing, or you just want to feel like you're at a tropical island beach resort. I really think there is nothing like spending time in a hammock. If you have never had the pleasure of spending any time just gently rocking in a hammock it’s a definite must try. I have been to a number of beach resorts that have colorful hammocks dotting their private beaches. You can usually find them between two palm trees if you are on a tropical island. If the tropics are not your thing and you are more of a mountain person have no fear. Some of the greatest hammock naps I have ever taken were up in the mountains. Both the Rockies Mountains and The Great Smokey Mountains are excellent locations to just unplug and unwind. If you are up in the mountains maybe alongside a pond or lake, look for your hammock get away tucked in between the pines. I don’t know if I could put my finger on an all time favorite vacation location. It could be on one of the islands in the middle of the Caribbean or a lodge on top a mountain somewhere. I have been to the middle of the jungle and on the edge of the Dead Sea. No matter where I call home for the night, as long as there is a hammock someplace where I can put my feet up and relax after a long day of exploring the island and all of it beauty or hiking up a peaceful mountain trail time in the hammock at the end of the day make me a very happy person. There have been some places we have stayed that by having the hammock to enjoy changed a marginal 3 star hotel, lodge or resort into a promising 4 star in my book. Some of the best hammock beaches I have visited have been in Puerto Rico, The Bahamas, Panama and Jamaica. These beaches are perfect for making it easy to enjoy a leisurely afternoon, lounging in a the shade of one of their palm trees and enjoy the ocean breeze. Many of the hammocks we have found have been large enough for two people to enjoy together. This makes it not only relaxing but romantic at the same time. Just a word of caution: when you are in a hammock for two and one of you want to get out, don’t just get out. If you do your partner can find themselves landing on the ground below with a hard thump. This has a real probability of killing the whole romance aspect of the hammock for two. Yes this is a voice of experience. I have so many favorites for relaxing in a hammock from around the world it’s hard to narrow them down. Here are a few of my favorite places I have been able to enjoy “hang time” in a hammock: The first hammock spot was on a private island off the shore of Puerto Rico. It has to be one of the best places for a hammock nap in the warm sun. My second favorite spot was in the country of Panama. There were two separate locations that were great hammock experiences. The first was when we stayed at The Gamboa Rainforest Resort. Not only was it a great resort but there was an amazing hammock on the balcony of our room for our lounging pleasure. What was great about this location was we had a great view of the wildlife roaming along the country side. The second was located in the middle of the Panamanian jungle where we had the privilege of spending time with the Embera people who live there. While we were there we were allowed to spend the night in their “guest suite”. If you have never gotten the chance spent the night in a hammock it is kind of like being cradled by gentle arms all night long. It is a very peaceful experience indeed. For those of you who are unable to just jump on an airplane and head to a tropical island for a long weekend or extended vacation, but still want to feel like you are on vacation, whether it is tropical, mountain, river or just in your own backyard owning a hammock is the best way to accomplish the goal. My mother-in-law has one in her backyard and I am in it every chance I get. There is simply nothing like floating above the ground, gently rocking in the breeze on a warm afternoon. In my opinion it is the best way to take a little mini vacation any day of the week. If you have a stressful day at the office or the kids are driving you crazy, taking a break and relaxing in a hammock for even just 10 minutes can make your day so much better, not to mention your state of mind. Copyright © 2016 Harmony Hammocks. All Rights Reserved.